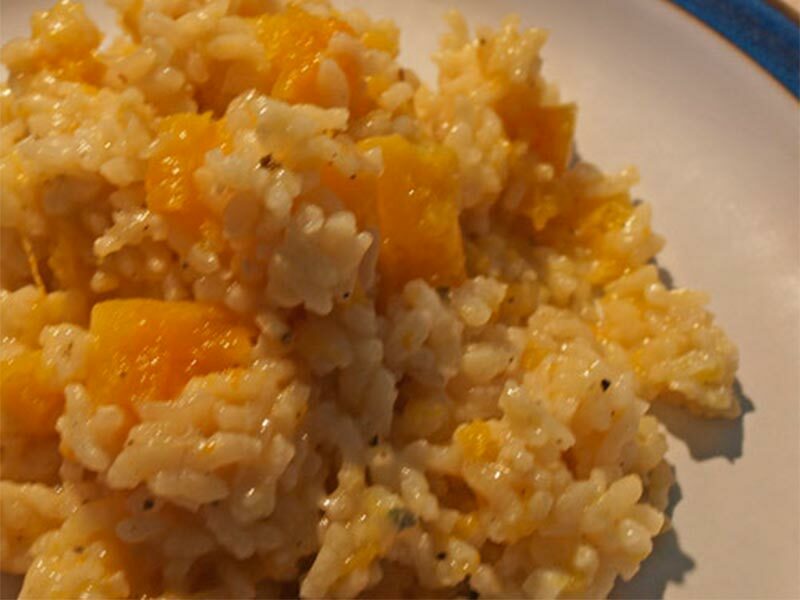 Squash risotto is real comfort food, can be cooked in advance and is amazingly easy. Finishing in the oven might seem strange and it almost changes the dish from risotto to gratin but bubbling butter and cheese and a slight crust is irresistible. The Worshipful Company of Risotto Makers would probably issue a Fatwa and have me sleeping with the fishes at the idea but that’s because they didn’t think of it. You can do it all in advance, it even freezes well and you can definitely re-heat it the next day – almost from frozen. I have even spread it on toast. 1Heat the 25gm of butter and cook the onion to soft then add the risotto rice and turn to coat. 2Season with salt and pepper and add the wine, cook until the wine is almost totally absorbed/evaporated. 3Heat the stock in a separate pan and add to the rice a ladle at a time. Keep stirring. 4Meanwhile, toss the diced squash with olive oil, seasoning, rosemary and garlic and roast in a hot oven (200°C) for 20 minutes until tender and beginning to caramelise, remove and reserve. Leave the oven on. 5Once the stock is almost absorbed and the rice very nearly done, add the roasted pumpkin. Stir and add the diced butter, grated Parmesan and a tbsp of Balsamic vinegar. Stir again. 6Transfer to the hot oven for ten minutes until the butter begins to bubble through.